ALLUVIAL mining activities in the country is largely unregulated, according to the Papua New Guinea Extractive Industries Transparency Initiative Report 2014. The report stated that this would leave authorities and stakeholders with limited information about the alluvial mining segment of the mining industry. The report in 2014 (reporting year) said alluvial mining accounted for 120,000 ounces of gold, representing around 6 per cent of the total gold mined in PNG, and K373.4 million in export revenue. “There were around 49,000 ounces of silver produced valued at K2.3 million. The Mining Act 1992, allows people to mine for alluvial minerals on their own land by non-mechanical means without the need for a mining licence,” the report said. 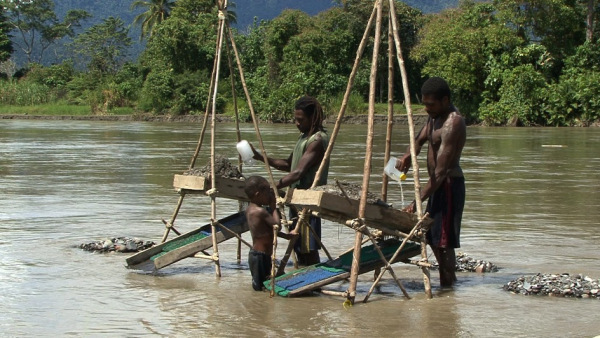 “Ninety per cent of alluvial miners in PNG use rudimentary sluice boxes and gold panning dishes. The report said more than 4000 had undergone training at the MRA’s small-scale mining centre in Wau, Morobe. “Small-scale mining conducted with powered machinery requires an alluvial mining lease or mining lease (for alluvial purposes) from MRA.” ALLUVIAL mining activities in the country is largely unregulated, according to the Papua New Guinea Extractive Industries Transparency Initiative Report 2014.